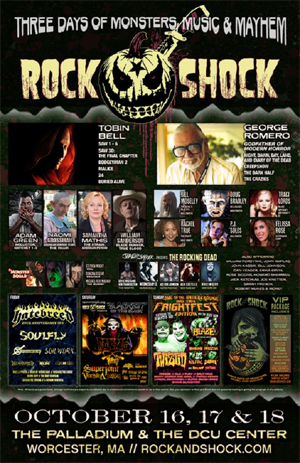 As your local shops fill up with skeletons, vampires and friendly ghouls to hang about your house, thoughts turn to Halloween, and for folks dedicated to all things horror, that includes planning their annual trip to the biggest horror and music convention on the East Coast during the spookiest of seasons; Rock And Shock, October 16th through 18th. Rock And Shock will celebrate their 12th year of music and mayhem at Worcester, MA's DCU Center with a full schedule filled with panels, film screenings, activities and contests running across a show floor jam packed with excellent guests and awesome vendors. This year's guest lineup includes George Romero, Godfather of Zombies everywhere (and director of Night Of The Living Dead if we need to mention that), Tobin Bell (SAW Films), Naomi Grossman (American Horror Story), William Sanderson (Blade Runner, True Blood), Samantha Mathis (The Strain, American Psycho, Pump Up The Volume), Adam Green, Bill Moseley, William Forsythe, Doug Bradley, PJ Soles and more. This years' bands include Danzig, Hatebreed, Twiztid, Prong, Soulfly, Soil Work, Blaze, Witch Mountain, Sanctuary, Superjoint and many more. Part of the "many more" is a special addition you'll find only at Rock And Shock. Last year, primo photographer Jeremy Saffer presented to us THE ROCKING DEAD. A band of music's finest was assembled from acts that were on the Rock And Shock bill as well as surprise special guests, and with a mere sound check as their only practice as a unit they took the stage and belted out a set of classic MISFITS songs. When they were done the fans knew they had seen something truly special, and in many a mind there grew hopes that this rare assembly would return. Well, their voices were heard, and Jeremy Saffer will once again present THE ROCKING DEAD to you this year, but this time, the monster has grown. Led by musical director, protector of animals and rock and roll guitarist extraordinaire Ace Von Johnson, a band has been assembled that brings back many of last year's gang but, like any good sequel, this one is even bigger. They’ve got three days of films rolling out as well, including Chainsaw Maidens, Old 37, Fury, Diary Of A Deadbeat, Pieces Of Talent, plenty of shorts and some surprise features. After cruising the show floor to shop with an incredible array of vendors, you can take in programming where amazing folks from the horror industry share their secrets with you, visit the Rock And Shock Creative Lair and learn drawing, writing, mask casting, creative activities and more, wave hello to super talented cosplayers roaming the floor or join them in our Cosplay Contest (for little AND big kids!) sponsored by Halloween Outlet and swing by the Idle Hands booth to test your horror knowledge or accept a challenge, all for killer prizes. While every day at Rock And Shock provides a kid friendly atmosphere families will love, Sunday is Kid’s Day with a schedule including face painting, pumpkin decorating, a coloring contest and a cosplay contest just for your little monsters. They also show our appreciation for our servicemen on Sunday by offering free admission to all police, fire, EMT and military personnel. Just show your service ID at the doors and you can receive up to four free tickets to the convention. For complete information visit Rock And Shock on the web HERE.